It all starts with a hearty breakfast, then a hearty lunch, followed by a... Perhaps you get the picture now, and might have an inkling as to why riding a motorcycle for 500 kilometres and 10 hours might not have an impact on my ability to fit into shrinking riding gear, although I will be the first to admit that while finding one is losing weight is a wonderful thing, the realization that ones heated gear no longer functions at peak operating efficiency can be bit hard to bare in this colder climate. We headed over the bridge then took a side cut down off of 16 where the bulk of the traffic is to be found, and skipped most of it on Route 955 through Murray Corner. A fun little route that bikers should be familiar with to get away from that trucker and tourist traffic on 16. Once you exit Moncton itself, Route 114 winds its way along the shoreline of the Petitcodiac River, where the tidal effect of the Bay of Fundy is so great, that people have been known to surf on the river! Just outside of Mountville NB, the road puts you right on the coast of the Bay of Fundy, and the view really improves! I'd taken the main road in to Alma many times, but wanted to explore a bit so guided by my Garmin 60cx I turned south off of the 114 onto the 915 towards Harvey Bank along Marys Point Road. They even built a lighthouse... For the tourists. A road and a motorcycle gang. Perfection. The wildlife area is just so beautiful and wide that I simply couldn't frame it properly, so you are just going to have to get on your motorcycle and go see it yourself. stand up on the pegs and throttle out. 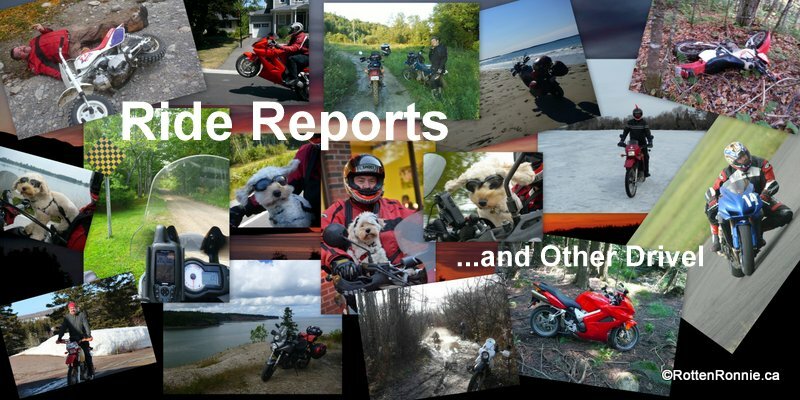 The 915 winds along Chignecto Bay and leads you to a wonderful access road to the Cape Enrage lighthouse and rock beach at the foot of Barn Marsh Creek. Why was Brian constantly saying "A bit further back..."? And another... Oops, same one sorry. Selfie time. I had no idea it would be this hard to get my big head into such a little shot! Looking north along Barn Marsh Creek. I'm really enjoying the views from the shoulder of the 915 and Brian is patient enough to allow me my time with the camera. The 915 ends abruptly as it spills us out into the small town of Alma NB where fishing and tourism seem to be the main industry for the inhabitants, but they are especially good at the baking of sticky buns where I purchase a half dozen to take home to my Island family, and at fish & chips across the street at The Boathouse Restaurant. 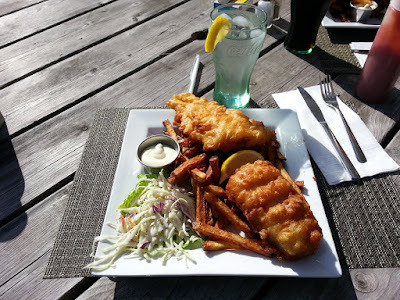 The BEST fish & chips in New Brunswick! How do you compete with perfectly done generous portions of fish over top hot hand cut french fried potatoes with a side of fresh coleslaw? All it needs is a cool iced tea with lemon and you are in business. 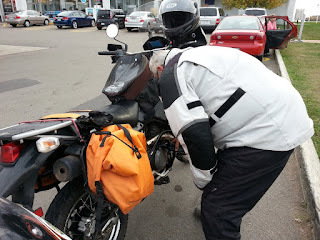 If you have ever owned a KLR then there is no need to tell you what is happening in these pictures. 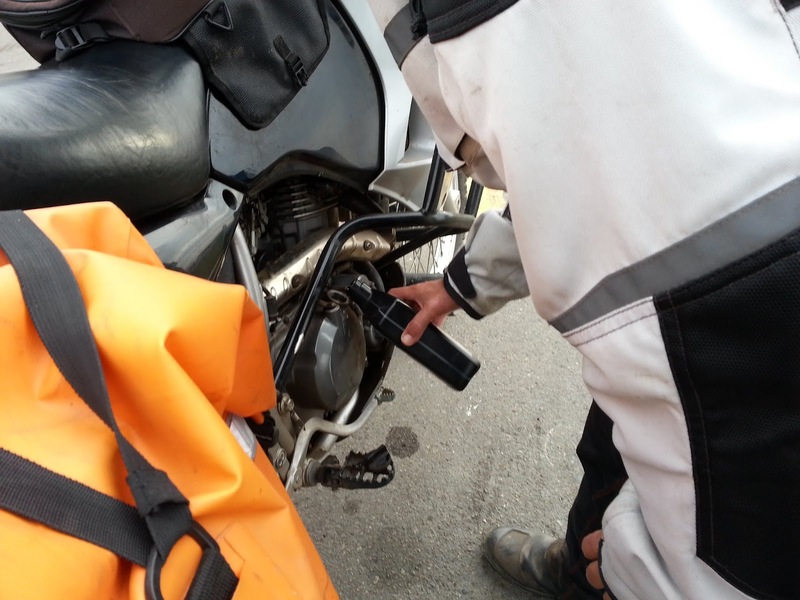 For the rest of you... You never need to change the oil on a KLR, but it is necessary to always top it off. Over and Over again. 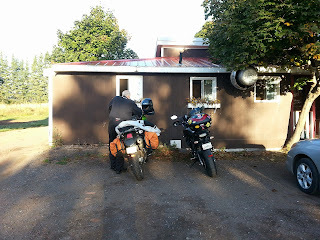 We gassed up in Alma, you know, the only fuel station this far south... and headed into Fundy National Park which winds it's way into the hills with some rapid elevation changes that make for a fun ride. Inland and away from the coast we started to see more of the fall colours that we had been expecting to see on this ride. As neither of us relished more time than necessary on the highway, we crossed over the Trans Canada Highway and made our way back towards Port Elgin and the Confederation Bridge on a number of lovely little roads, and Brian was politic enough not to laugh when I had to do a u-turn on a private road to get us back on track and headed home. What, lost again? Maybe you should bring a map next time, Ron.